Monica Simmons, M.Ed. & Susan B. Brown, Ph.D. In the 21st century, single parenting continues to grow as a dominant parenting style in the United States. But that does not make the task any easier! One parent must juggle multiple roles in the family . . . alone. and parenting for the future. Brown and Simmons will help single parents become more efficient and prepared for the unexpected while creating a family of important values, strength, and love. 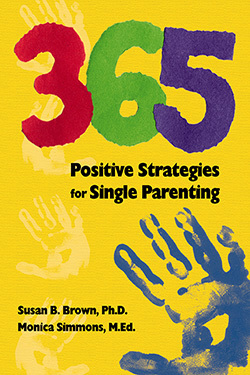 365 Positive Strategies for Single Parenting is an ideal resource not just for custodial parents but also for noncustodial relatives, school counselors, ministers, or anyone working with children of single-parent families. With all of your priorities in order, a sense of confidence about your single parenting skills, lots of positive strategies, and the expectation of positive results, you will have the reward of happy, healthy, successful children. Susan B. Brown holds a doctorate in the field of learning disabilities and is an associate professor at Kennesaw State University in Kennesaw, Georgia. She has hosted seminars on the topic of "Parenting Special Needs Children" for the past 20 years and speaks to national and state conventions on behalf of children for the betterment of education. Brown is the single parent of twin teenage boys. Monica Simmons began writing children's books in 1987. She taught handicapped children in the Atlanta area for 13 years and taught at the graduate level at the University of Georgia for two years where she is now pursuing a doctorate in Educational Curriculum. She has been a guest speaker on education at state and national levels. Simmons is the single parent of two elementary school-age children.